Developing your back muscles can make the waist appear smaller and give the physique a more powerful appearance. However, working the back is about more than aesthetics. Training your back will help you improve overall strength, posture, and form in your workouts. The back is complex and training it can be difficult, if not overwhelming. It is further complicated by the role that biceps play during back exercises. Here are a few key tips to help you keep the focus on your back. The Latissimus Dorsi are right under the armpits and extend down attaching to the waist. The Spinal Erectors are located at the lumbar region (back of the waist) and attach to the vertebrae, ribs and pelvis. Learn how to activate the lats. Many beginners overuse the biceps and fail to incorporate their lats. The latissimus dorsi cover a vast surface and are one of the largest muscle groups in the body. They affect several major functions such as working to medially rotate and extend the shoulder joint and assist in lateral flexion of the trunk. When you are performing lat pull downs, first try lowering the weight so that you can achieve a greater mind muscle connection. Keep your body upright with a slight lean back from your hips, lift your chest up, and pull the bar just slightly under the chin. Use a full range of motion, stretching all the way to the top between each repetition. Pull with your back muscles and not your biceps or forearms. Think of your hands as hooks that connect your elbows to the weight. Your hands are holding the weight but your back muscles are doing the work. Consider using Versa Gripss (versagripps.com) to ease tension on the forearms and allow for more back muscle activation. Alway focus on form and lower the weight if needed to achieve a greater connection to the muscles. Learn to retract your scapula to provide support during rowing exercises. As with pull ups and lat pull downs, beginners often make the biceps the primary muscle group during rows. Protraction of the scapula occurs when you roll the shoulders forward. Scapular retraction is achieved when you bring your shoulder blades together and use the rhomboids and traps as the primary muscle groups. Protraction and retraction of the scapula can be used together to secure the scapula and give support while you move your arms. We are going to hit the back hard with this workout. However, the goal is to achieve a mind-muscle connection. Focus on each exercise and visualize the movements. Reduce weight if necessary to help you with this connection. As always modify reps, sets, and exercises for your fitness level and goals. When performing pull ups learn to control the shoulder blades (scapular activation). Set your shoulder blades down and back with each repetition, tightening the back muscles and preparing you to perform a proper pull up. 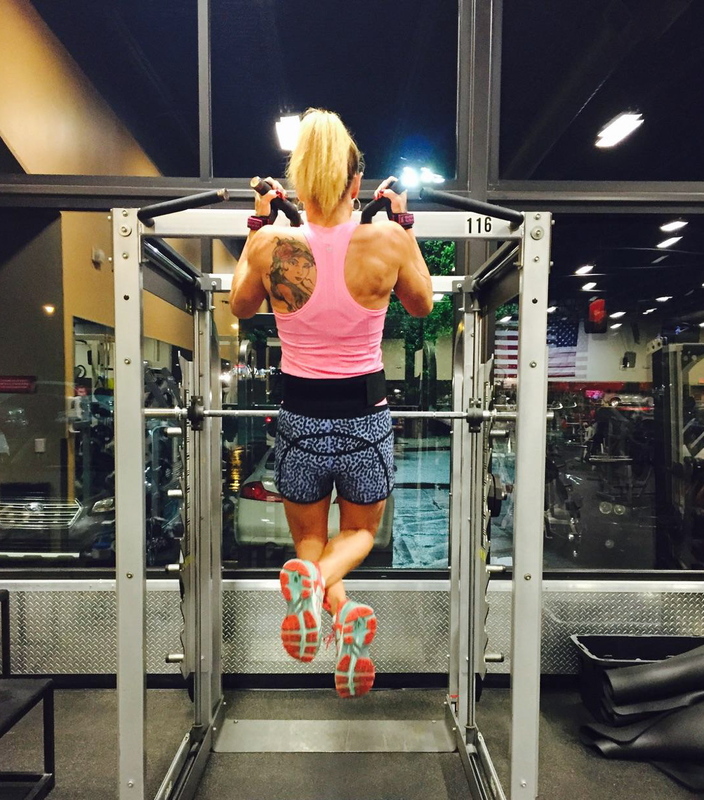 Even if you cannot perform a full pull up, you can try partial reps to activate the back muscles. Begin in a dead hang and be sure you can set the shoulders down and back. Once you learn to set the shoulders, you can try bending the elbows and adding a small range of motion up toward the bar. You can also practice the motion on an assisted pull up machine. 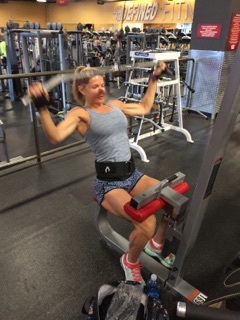 Wide Grip Lat Pull Downs: 4 sets X 12-15 reps w/45 seconds rest between sets. Single Arm Lat Pull Down: High Iso Row Machine 3 X 15 reps each side (no rest) Sitting side saddle reach back and to the side to grasp the bar. Each time you pull down, focus on the lat muscle. High Pulley Cable Face Pull: 3 sets X 15 reps w/30 seconds rest. Use lighter weight on these and hold the contraction. Pulling back a little farther will use more of the upper and middle traps. Straight Arm Dumbbell Pull Overs: 4 sets X 12 reps w/30 seconds rest. Focus on the lats. Elbows soft and not locked. Full range of motion. 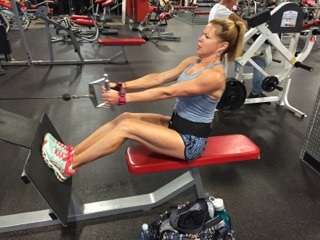 This entry was posted in Back and tagged Workouts Exercise by carolcovino. Bookmark the permalink.